Your frame comes with your choice of Top and Bottom Mats. You can use the Mat Colors link on the left menu to see all the color choices available. You can change the background color to any of the mat colors so you can see how your mat choices to together. My most popular choice of mats is Antique White for the outer mat and Black for the Inner Mat. This combination will go well with just about any newspaper, magazine or comic and is a good choice if you will be rotating a number of different items in your frame. Chosing a White. 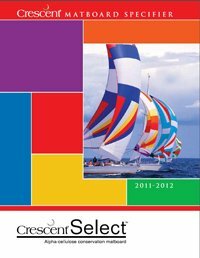 The white used on most magazines is not a pure white and Antique White goes well with the white used on many magazines. If your magazine uses a pure white, then Very White is a good choice. Chosing a Black. Black (#921) is a smooth black and is my most popular black. If you would like a little texture in your black, then Raven Black is a good choice. Chosing Other Colors. If your item has a strong color theme, you might try to match one or more of the colors in the item. Using a white for the top mat is always a safe choice. You can match one of the colors in your item to the bottom mat. The matboard specifier images below are good examples of items with strong colors. The first two have a riot of colors in them so trying to match to any of those colors might be problematic. A safe white/black combination might be best for these. The third image has a single strong color that you might match for the bottom mat with a bright white for the top mat. Decorative and Select Mats. Your frame comes standard with Crescent Decorative or Select Mat Board. This has a light cream core and is buffered and pH neutral. The Decorative mats are not a conservation product, the Select mats are. Since your collectible is encapsulated in conservation grade Mylar, conservation Mat Board is not necessary. 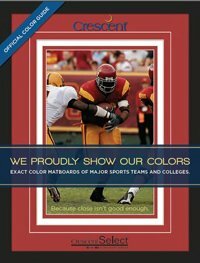 If you do want a conservation Mat Board, choose one of the Select Mat Boards. These have numbers in the C9500 to C9900 range. 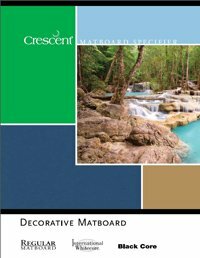 The specifiers below show all the mats available in the Crescent Decorative and Select line. Most of these mats are available when selecting your mats but some are not. If you see a mat color on the specifiers below that I don't have in my mat choices, contact me to see if it is available.